Sweet, juicy and full of flavor, this collection is a real eye opener. 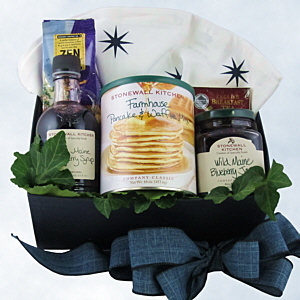 Inside you find light and fluffy Farmhouse Pancake & Waffle mix, delicious Wild Maine Blueberry Syrup (8.5 oz. ), Wild Maine Blueberry Jam (12.5 oz.) and a handy Holiday Tea Towel. Of course no breakfast would be complete without a hot cup of coffee or tea, both of which we've included to make a complete and completely delicious breakfast!